Midfielder Hiram Boateng believes his fellow Cystal Palace loanee Keshi Anderson can ‘thrive’ while at Sixfields providing the Cobblers can provide him with the right service. Striker Anderson is the only signing that has been made to date by Cobblers boss Justin Edinburgh, and he made his debut as a first-half substitute when he went on for the injured Alex Revell in last Saturday’s clash at Milton Keynes Dons. 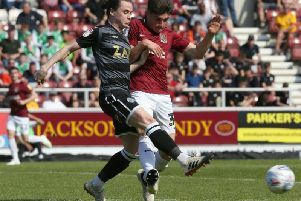 The 21-year-old has signed on at Sixfields until the end of the season and he showed some promising signs in the 5-3 defeat, winning the penalty for the Cobblers’ third goal, but he was also left to rue a missed one-on-one chance admitting he was ‘caught in two minds’ before wasting the opportunity. Boateng has trained and played regularly with Anderson since the latter signed on at Selhurst Park from non-League Barton Rovers two years ago, and he is happy to give his club-mate a glowing reference. “With Keshi, he is a very sharp player and I think he’s quite dynamic,” said Boateng, who himself only turned 21 earlier this month and is currently staying at the same hotel as his team-mate. “He offers something a bit different as a front man who is not maybe as big as other strikers, who are taller. “He is a bit smaller but he still has that strength and bit of grit about him, and I think he’ll be a very good addition to the squad in the weeks to come. Boss Edinburgh is also excited by Anderson’s potential, having also tried to sign him for his previous club Gillingham, and he too was encouraged by the youngster’s debut at Stadium MK - even if he was forced into the action a little earlier than planned, with Revell hobbling off after just 21 minutes. “I thought Keshi showed glimspes of what he is capable of,” said Edinburgh, who thanks to Revell’s injury seems certain to start Anderson in Saturday’s Sky Bet League One relegation battle with Coventry City at Sixfields. “He is lively, he gets himself in good positions where central defenders perhaps don’t want to go and he has good feet and did well to get the penalty for us on Saturday. “He said to us after the game that he got caught in two minds when he got put clean through, and he does need some game time. “That unfortunately came a little bit earlier than we all expected, but he showed some glimpses that he and Rico (Marc Richards) can forge a good partnership, get among the goals and start getting us some points on the board.